It is a wild weather ride we are experiencing here in New England. Some of the coldest mid-December weather in the decades Thursday-Friday last, then a Saturday snowstorm, then 50s on Sunday. To change the weather this much takes a lot of wind. We had gusts past 50 mph in both the cold, and then warm, but now we get a break in the wind as the temperature levels off this afternoon. Canadian high-pressure brings us mostly sunny weather with temperatures in the 20s south, and teens north this afternoon. Wind from the north 10-15 mph is generating a bit of ocean affect snow along the coast South of Boston and on Cape Cod. With a clear sky tonight, and relatively light wind, we will cool down to 10 to 15° south, close to 0° in much of northern New England. High-pressure moves offshore tomorrow, allowing for a somewhat warmer breeze from the southwest getting our temperature back above freezing in many spots. 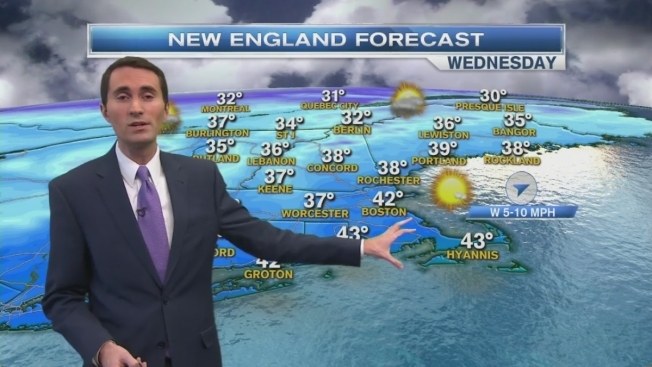 Mostly sunny Tuesday, high in the 30s south, close to 30° north. Low pressure passing to our north on Wednesday will bring in some clouds and a bit more wind, perhaps a few snow flurries in the far north. Highs Wednesday close to 40° wind from the west 15 to 20 mph. A cold front enters the region Thursday with mostly cloudy skies, and a few showers or flurries, perhaps heavier snow showers late in the day. High temperatures near 40°. High-pressure from Canada moves south of us on Friday with mostly sunny skies. After a cold start in the teens and 20s,we should warm to near 40° with a brisk breeze from the west. Christmas Eve Saturday looks mostly cloudy and breezy with a chance of a few flurries North high temperature again close to 40°. Christmas day likely features a powerful storm in the Midwest bringing a snow storm to the northern Great Lakes and rain from Michigan south to Louisiana. 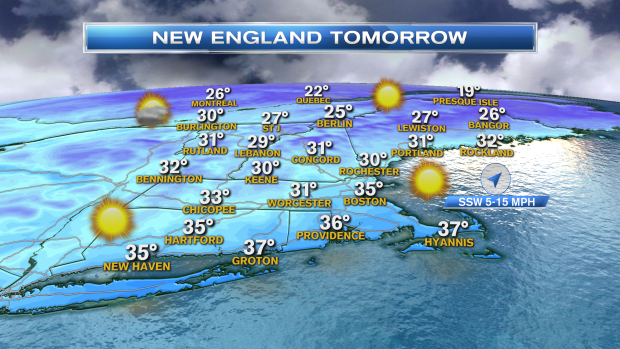 At this time it looks like New England should be just ahead of that system with increasing clouds and seasonable high temperature in the 30s. A wintry mix may arrive late on Christmas day and especially at night into early Monday, as a that storm moves into Quebec. That is a pretty close call with our Christmas Sunday forecast. We will be monitoring with updates coming throughout the week.